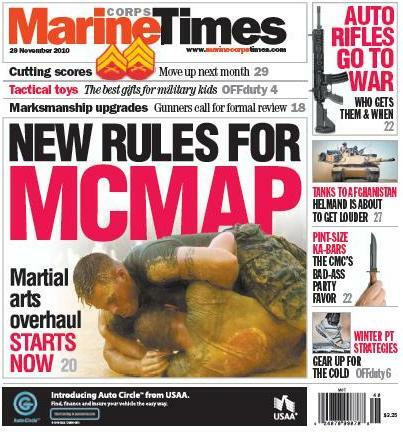 This week's cover story lays it all out: new rules for MCMAP training. Less training hours, more safety rules, new testing on values and stricter injury reporting criteria. These are just some of the details contained in this week’s Marine Corps Times on the new rules for the Marine Corps Martial Arts Program. All Marines will still be required to have a tan belt, the lowest belt on the five-belt MCMAP system, but Marines wishing to move up can do so more quickly as the requirement for training hours has been significantly reduced. It’s all in the chart on page 20. If a Marine gets hurt beyond reason, not only will the injury be reported, but the depth of information required about it will increase because it will be submitted now as a “mishap report” which asks for a lot more detail, including the name, rank and certification level of the instructor. Check it out, get informed and, as always, let us know what you think!